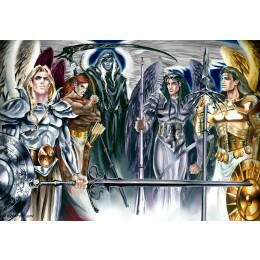 The Five Archangels is an open editon print taken from my Book of Angels. The Angels in the image are, left to right--Michael, Uriel, Azriel, Gabriel and Raphael. I really loved doing this piece...I believe the guys just took ahold of me and said..."paint us now!"